Road trip! Members of the zoo’s Horticulture team source sage for the birds out at the DWCC, and have an adventure along the way. 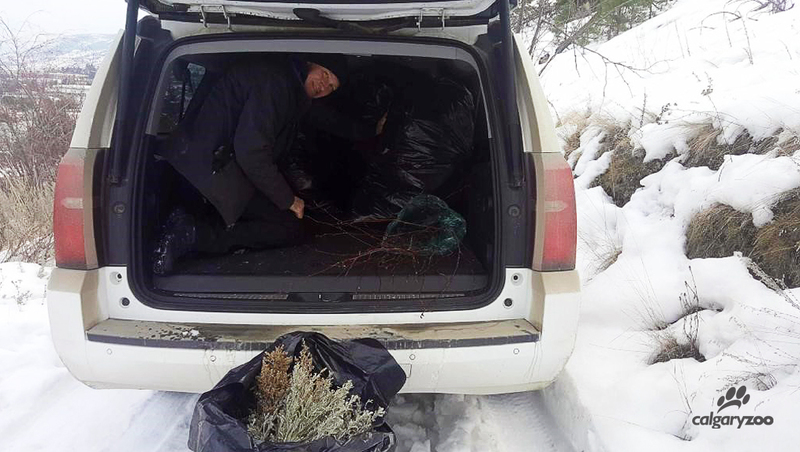 Habitats supervisor Ryan Neilson can be relentless when searching out sources of sage for our greater sage-grouse at the Devonian Wildlife Conservation Centre. Silver sagebrush (Artemisia cana) and relatives play a vital role in sage-grouse diet and habitat. While managed sagebrush production is currently in the works, it will take a little time before the horticulture department can fulfill all the needs of our charges at the ranch. The team rented a vehicle and when they reached the site, got to work filling it up! To bridge the gap, our intrepid Ryan scoped out likely supplies of the closely allied big sagebrush (Artemisia tridentata) in neighboring British Columbia. After numerous phone calls he hit pay dirt! Kirsten Wourms, the Naturalist of the City of Kamloops knew just the spot. A portion of land in the Kenna Cartwright Park was slated for clearing to make way for the installation of a powerline – and it was a gold mine of big sage brush! As they say, timing is everything. 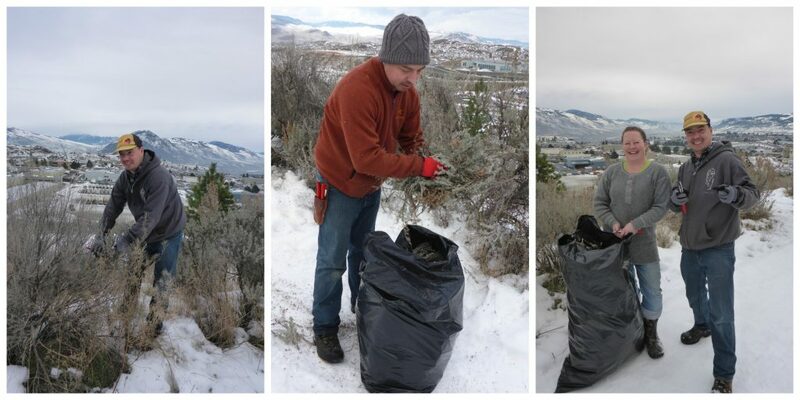 The team collected big sagebrush along with Kirsten Wourms, a naturalist for the city of Kamloops. So a few weeks ago, Ryan and Greenhouse Operations Supervisor Boyd Nave set out for Kamloops. Kirsten was better than her word, not only providing our team access to the harvest location but spending several hours helping them cut the beefy stocks of big sage. She was also able to share our conservation story on the morning radio show and is exploring the possibility of supplying volunteers should another collection trip be required. In short, we think Kirsten rocks! A full van and a very successful collection trip! Two long days of harvest and the rented Suburban was packed full of pungent sage. Back in Calgary members of the Horticulture team, Foothills staff and volunteer staff members from other departments processed over five hundred bundles of big sagebrush. These bundles will provide nutrition and nesting for the greater sage-grouse in our captive breeding and rearing program at the DWCC. 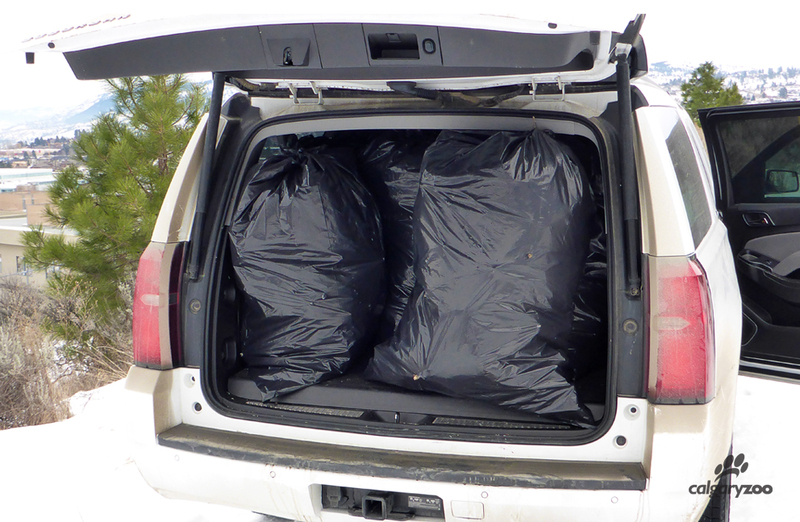 Measures such as this collection trip certainly illustrate that conservation is a community effort. Our sincere thanks to all those who participated in contributing to the well-being of this iconic prairie species. Follow our conservation stories on here and on social media using the #conservationconversation hashtag!